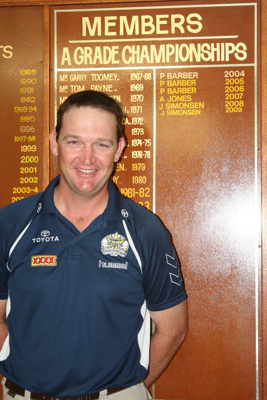 This image is of Graeme Back, taken in front of the Hughenden Golf Club Honour Board in October 2010. Graeme was raised on Landsborough Station near Hughenden and worked for Queensland Rail for a time, before getting his qualifications as a plumber. He met his wife Karen when she moved to Hughenden in 1997 for a position as a primary school teacher. They married and had three children - Thomas, Lachlan and Charlotte. The family moved away from Hughenden at the end of 2010.